Against the Wastelords is a complete advanture for the roleplaying game Darwins World. The adventure is set in an indistinct corner of the desolate Forbidden Lands, a valley known as the 'Tradelands' due to the traffic of important goods that moves through the area. The scenario involves the charactersa being hired by a merchant consortium to rid the arwa of a powerful raider threat - the 'Wastelord'. Against the Wastelords is intended as a handy introduction to the dangerous and gritty atmosphere of Darwins World. 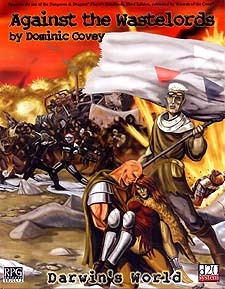 Consisting of an easy means to gather disparate individuals together, the scenario features a few scattered encounters which soon build up int oa conflict of wide-ranging impact; battles in fact, in which the characters will be given the authority to lead the soldiers of the region against the raiders in all-out large-scale war.